1. The limits of localism. A number of urban luminaries, including Bruce Katz and Richard Florida have been urging that we pin our hopes for social and policy change on local governments. At City Observatory-enamored as we are of cities-we’ve been skeptical of that argument. This week, some of our concerns were echoed by the Brookings Institution’s Amy Liu, who in a CityLab commentary, argued that over-selling localism is being used as an excuse to dismantle or diminish critical federal programs. 2. Does new construction lead to displacement. A recent study from the University of California, Berkeley, looks to see whether the construction of new housing leads to higher rates of displacement in nearby areas. The study looks at block-by-block data for San Francisco on the construction of new apartments and the service of eviction notices. It finds essentially no connection between an uptick in construction and an increase in eviction notices. If there were ever a market where one would observe these kinds of highly localized effects on displacement, it would be San Francisco, where housing markets are tight, new apartments are expensive, and new construction is highly limited. Although evictions are a less than perfect proxy for displacement, this study is powerful evidence that there’s little if any connection between new buildings and neighborhood displacement. . . .as with so much else in urban politics, at the end of the day, the scooter controversy is on some level primarily about parking. Scooter haters don’t like the idea of sidewalks littered with parked scooters, and car drivers don’t like the idea of giving up more curbside space for dedicated lanes in which bikes and scooters can safely travel. 2. Not disruptive enough? 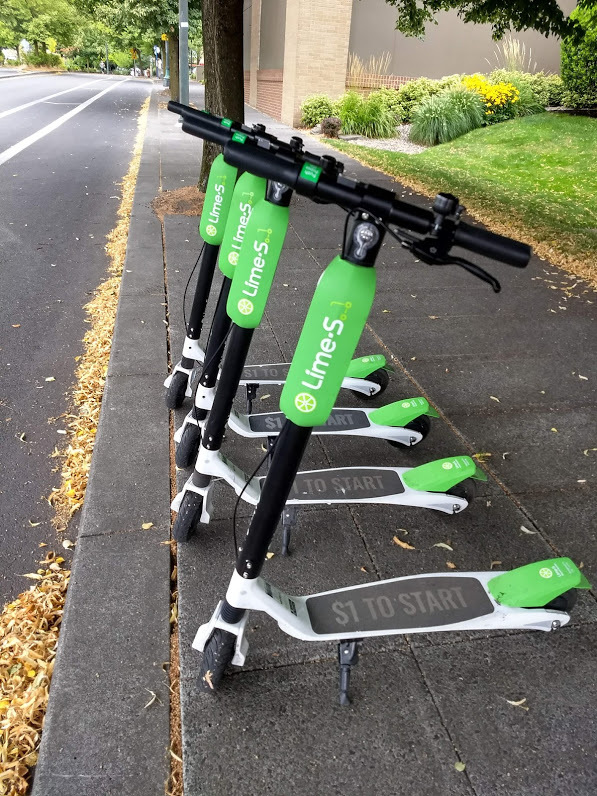 While many decry the scooter scourge, Slate’s Henry Grabar argues that Lime, Bird and their rivals have collectively been too timid. Unlike the ride-hail companies Lyft and Uber, which famously moved forward, often in technical or actual violation of local laws to the contrary-“better to seek forgiveness than permission”-the scooter firms have mostly dutifully deferred to local regulators. That means they’re moving too slowly, Grabar argues. San Francisco has imposed–and scooter firms are observing–a tight cap on scooter numbers. The result is that the availability of scooters is so sparse, and the area that they can cover so limited, that they’re unlikely to achieve the critical mass needed to be a viable, regular transportation option. A little more latitude to experiment–even if it’s messy and produces some failures, is a better way to create a more truly multi-modal transportation system. Using Yelp data to measure gentrification. There’s a new working paper from Ed Glaeser and two collaborators using big data to identify the correlates of neighborhood change. The big data comes from Yelp’s business listings and reviews, and the measures of neighborhood change look at increases in resident education and changes int he age structure of the population. The study finds that zip code changes in neighborhood demographics, measured at the zip code level are correlated with increases in grocery stores, restaurants, bars and cafes. It also appears that increases in housing prices occur after increases in local businesses (consistent with our own finding that places with higher walkscores (a proxy for the concentration of businesses) experience higher home values. The study has been widely reported as showing that a Starbucks store opening leads to an increase in home prices, but its important to remember two things: correlation doesn’t equal causation, and its likely that Starbucks is pretty sophisticated in selecting neighborhoods and locations with very good growth prospects. One other sidelight of the study: despite the increase in cafes, bars and restaurants in these gentrifying neighborhoods, Glaeser et al report “little evidence of crowd-out of other categories of businesses.” This suggests that new businesses add to the neighborhood rather than replacing existing businesses.